Medical walking boots are used to protect the foot and ankle after an injury or surgery. They are commonly used for stress fractures, shin splints, broken foot or ankle bones, and severe ankle sprains. Medical walking boots aid in the beginning of the rehabilitation process by stabilizing and protecting the area while it heals. 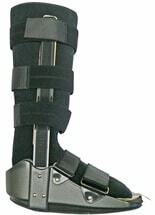 As the foot or leg begins to heal, a walking brace slowly allows weight to be put onto the injured foot as the person transitions towards a full recovery. Your doctor may recommend a walking cast also known as an orthopedic walking boot instead of a full cast that will immobilize you. 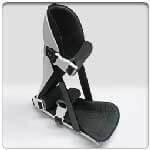 Buy Direct from US Manufacturer The is a popular low top ankle walker that is perfect for ankle sprains and fractures of the foot. This product has preinflated air cells inside surrounding the ankl Read more..
Buy Direct from US Manufacturer Enjoy comfort and mobility while recovering from a lower-leg injury with the ! Ezywrap is proud to bring you a product that offers you the support you need with the c Read more.. The foundation of our ezy walker line is the low profile walker boot which helps to provide a more normal gait. The impact resistant, fixed, rigid walker with our contoured tricot lined softgoods and Read more..